The art world loves a good party. What is the point of opening a new exhibition if you can’t invite all your mates round and have a good time amongst the art? This week we started our trail of new openings at the Hanmi Gallery in Fitzrovia. A specialist Korean and East Asian contemporary gallery, it was celebrating the launch of a new show by Jeehee Park entitled ‘Elephant in the Room’. Art lovers met around Park’s sculptures – laser etched acrylic pieces that caught the light upstairs and the large-scale Fruit Battery on the ground floor. This produced electricity directly from fruit bought at Elephant and Castle, each piece chosen because of its popularity amongst local residents. It created a low-level hum, although there was a much higher-level hum coming from the streets outside which made it hard to pick out the sound of the fruit. Maybe Park has hit on the answer to the world’s energy problems – if the East Street market can provide enough oranges. Onward to the Mix show at the Lawrence Alkin Gallery. Here the partying was in full swing, the two small gallery rooms packed as the new group show opened. Works by well-known artists such as Banksy and Peter Blake hang alongside less celebrated artists. Look out for Art Thief on the steps going down to the lower gallery. 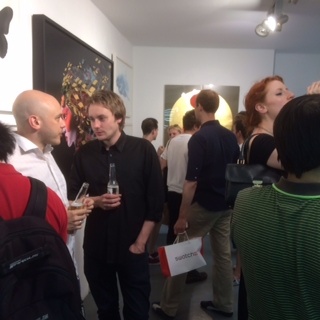 Much sipping of beer and a high burble level – a successful opening party. Sedition allows people to collect limited editions of digital artworks. These are by big names such as Tracey Emin, Yoko Ono and Damian Hirst. Their New Horizons show opened at the Hospital Club, with artworks displayed around the room on large ULTRA HD LG screens. Each screen drew a large crowd to watch the short-looped pieces, the most interesting being Lee Lee Nam’s animated prints from old Asian books – being sold in an edition of 500 from £19 each. The burble quotient was impressive as sparkling wine was sipped politely.